Everyone loves chocolate and it’s not hard to understand why. It’s delicious and it makes you feel good. There’s not much about chocolate not to love. Unfortunately, many chocolates are also filled with sugar and additives. They make that delicious chocolate unhealthy and even dangerous for diabetics. When you go with a good dark chocolate though, it can do your body and your diabetes a world of good. Dark chocolate is super nutritious. It’s especially hearty when it comes to antioxidants. Dark chocolate is filled with flavonoids polyphenol antioxidants and catechins. These nutrients work to beat inflammation and fight against illnesses. Dark chocolate is also filled with fiber. Fiber is used by the body to aid digestion and keep your heart healthy. Dark chocolate is also rich in minerals such as copper, iron, magnesium, manganese, phosphorus, potassium, selenium and zinc. Dark chocolate may have fats but they are healthy fats such as monosaturated fat and healthier natural saturated fats. Healthy fats like these keep your body running smoothly. A study done in 2004 about the heart and dark chocolate found out a few interesting things. The study was done by the Journal of American College of Nutrition and discovered that dark chocolate created from cacao is rich in flavonoids. The antioxidant properties, along with the inhibition of platelet activity, and the activation of endothelial nitric oxide synthase are all effects that protect your cardiovascular system and dark chocolate is responsible for them all. It really looks like eating some dark chocolate can do wonders for your heart. Which is funny considering what milk chocolate can do to it. Research has shown that dark chocolate can improve insulin sensitivity. It also helps to lower blood pressure. A study performed in 2005 by the American Journal Of Clinical Nutrition gave 15 healthy people either dark or white chocolate and analysed the effects it had on their blood pressure and insulin sensitivity. The results of the study showed that dark chocolate can reduce the blood pressure of healthy individuals and improve insulin sensitivity. It’s not hard to understand why this is the case either. White chocolate is made from cocoa butter and doesn’t come with any of the great antioxidant properties of dark chocolate. The mood-improving qualities of chocolate aren’t all in your head. It’s a proven fact that chocolate improves your mood. The cacao bean that chocolate is made from has an alkaloid called theobromine. This alkaloid stimulates your central nervous system and improves your energy levels and mood. Dark chocolate especially has phenylethylamine (PEA). PEA affects your brain in much the same way that falling in love does. It’s no wonder you love chocolate! Cacao also bolsters your levels of serotonin. Having more serotonin in your system can relieve depression and improve your mood. Even though you might think chocolate is a sugary snack, the fact is that it can be so much more than that. Raw cacao is unsweetened and works great as part of a savory dish. Cacao can be part of your spice rub too to add a lot of flavor to your sauces and stews. Cacao is also a real treat when combined with chili peppers, such as with the Mexican dish mole. 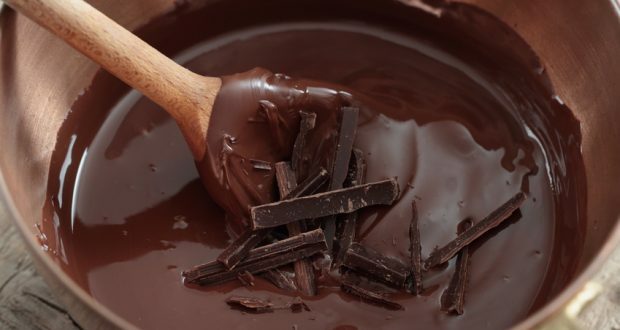 Dark chocolate also really adds to sweeter recipes and foods. Chocolate can be found in plenty of different desserts. If you want to get the most out of chocolate without eating a lot of sugar you can use coconut crystals, honey, or stevia leaves to sweeten your treats instead. You get the health benefits of chocolate without packing in the sugar. 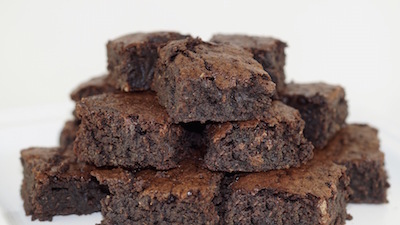 These delicious gourmet dark chocolate brownies are sugar-free. The best chocolate for your health is raw dark chocolate with little or no sugar. If you’re going to bake with it or want to make hot cocoa then pure cocoa powder (nothing added) is your best bet. Don’t buy the refined cocoa powders as they are often sweetened and worse for you. Starbucks Classic Hot Cocoa contains more sugar than cocoa and packs a whopping 12 grams of sugar in a cup. It can be a little expensive to buy good for you chocolate but considering the health benefits it’s hard to argue against buying it. Plus you still get to eat chocolate! Who doesn’t want that? These dark chocolate brownies are made from gourmet Guittard chocolate with just two net carbs per serving. Even better, they provide 60% of the daily RV for fiber and contain no artificial sweeteners or sugar alcohols. The antioxidant and insulin controlling powers of dark chocolate make it great for diabetics. Living with diabetes can be hard. Eating foods that help improve your insulin tolerance can definitely have a good effect on your diabetes. Type 2 Diabetes in particular can be controlled with the right diet. If you eat the right foods, such as dark chocolate, you can actually beat Type 2 and never have to worry about insulin again. Find out what other foods are great for insulin control and make them a part of your diet. Previous: Should Diabetics Skip Breakfast? I live in Philadelphia, Pa.
Where can I purchase raw, dark chocolate with little or no sugar ? I have type 2 Diabetes. I would check online as it may be a little harder to find it in a grocery store. You might ask you local health food store as they may have a resource and could order it for you as well. I have found 100% chocolate bar at Trader Joes … and believe me it all chocolate no sugar. Hope this helps. If I find a resource online I will post it for you too. Lindt makes a 90% dark cocoa supreme it’s A little bitter But good. 83-year-old mother-in-law eats it all the time and she looks wonderful and very active. Walmart ,Walgreens, And stores usually has it. Check Walgreens. They usually have a variety of dark choc. Lindt brand has dark choc from 50% to 100% dark choc. 100% is quite bitter. 72% to 90% isn’t so bitter. I always eat dark chocolate for my sweet snack cause it has less sugar and more fiber than milk chocolate. I’m a type 1 diabetic so I’m always looking to reduce my intake of unnecessary sugars. I also cut up apples and melt dark chocolate to make delicious dark chocolate covered apples. Publix has a dark chocolate bar no sugar, made with stevia by Lily’s very delicous.